TU/enable is a student-initiative aimed at students with a refugee background who are currently waiting for their status or have recently received their status. Do you have an academic background and are you seeking to actively maintain and develop your current knowledge and skills in preparation for a smooth integration in the Dutch education- and labour market? TU/enable offers newcomers in the province of Noord-Brabant a chance to participate in a selection of regular undergraduate courses for free, providing you with your first experience with a Dutch university. Upon completion of the course a certificate of completion can be obtained. What is required for me to participate in one of the courses on offer? In order for you to participate in one of the courses on offer you are required to understand and speak (academic) English. Participants are expected to have a level of education which is equivalent to at least the Dutch ‘vwo-diploma’ (secondary school) or to have prior academic experience. How do I apply for one of the courses on offer? Simply download and fill in our intake form (see Downloads), and send it to TUenable@remove-this.tue.nl. We will then get back to you as soon as possible. If you are not sure if TU/enable is something for you, you can also send an e-mail asking for more information or an exploratory meeting. How much time will each course take me? Each course is taught over a time period of eight weeks of lectures and assignments, after which an exam is conducted in the two weeks after that. Each course is expected to cost you approximately 140 hours throughout those 8-10 weeks, consisting of lectures, time spend on assignments and preparation time for the exam. Which courses are on offer? In the table below you can find TU/Eindhoven courses that are open for refugee students.These courses are taught in a certain quartile (period) in the lecture year. All offered courses are regular undergraduate courses of the Industrial Engineering faculty, the Electrical Engineering faculty or the Industrial Design faculty of which the lecturers have agreed to open their courses to students with a refugee background. More information on the offered courses can be found in the brochure through the download link on the right. Can TU/enable support me with books or travelling expenses? TU/enable will in all cases make sure that students have access to the necessary study material. Students that don't receive help regarding travelling expenses from another organization (AZC, Gemeente, UAF), are advised to mention this in their intake meeting. In some cases TU/enable will be able to provide support. Application deadline: August 12, 2018. Is traveling to Eindhoven too far for you? 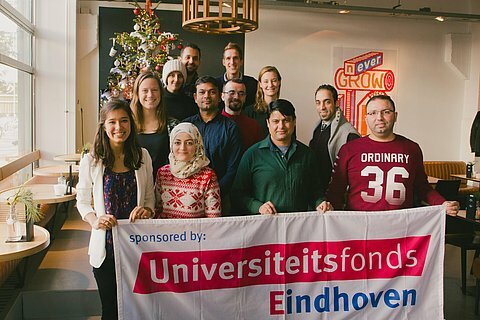 Our colleagues from the university of Utrecht and the university of Wageningen also have an initiative offering free courses to refugee students. More information can be found via these links: https://www.uu.nl/en/<wbr />education/incluusion and https://www.wur.nl/en/<wbr />Education-Programmes/WURth-<wbr />while.htm.